Hampshire Mezzanine Floors offer an innovative range of retail gondola displays, all demonstrating the versatility and flexibility they have to create a diverse range of retail display solutions. Various models are available, including glass gondolas, slatwall gondolas or just simply adjustable gondola shelving. All models are designed to ensure each unit is versatile to meet your display requirements and complimenting your retail shopping environment. 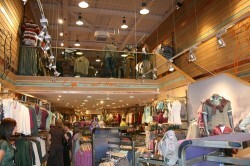 Slatwall panels are an excellent cosmetic addition for any retail outlet, whatever the nature of your business. 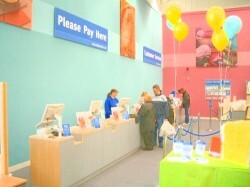 It is both a practical and cost effective solution to enhance your product display. We offer a wide variety of sizes and finishes including wood, melamine and veneer effects. It is a very flexible system, which also has a variety of accessories available to make your display both effective and eye catching. Signage and graphics is an extremely important part of any business. 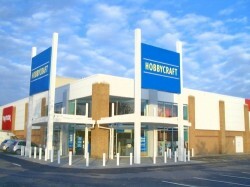 It’s at the forefront of your building and has the all importance of your customer’s first impressions. It is also one of the most cost effective ways to build your brand awareness. Over the years we have done bespoke signs and graphics for head offices, new builds, receptions and shops, with designs to reflect your company values, providing aesthetic and functional signage solutions. The time customers have to spend waiting to pay and their experiences in the queue are of vital importance to any retail or service operation. Poor management of the checkout process can have a negative impact on potential sales. We can provide a range of post, pole, rope and retractable pedestrian barrier systems for all your queue management solutions. Our counters are available in a variety of sizes, finishes and configurations to suit your own display requirements. You can also have glass display cabinets to compliment your merchandise. We also supply and fit counters with ledges which have a spacious and convenient open rear storage area. Hampshire Mezzanine Floors provide a wide variety of flooring to include heavy duty contract grade carpet tiles, non-slip flooring and barrier entrance matting. 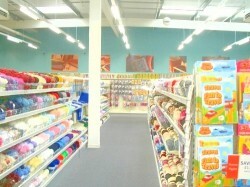 Hampshire Mezzanine Floor will also provide DDA compliant nosings and carpet accessories to compliment the environment. Hampshire Mezzanine Floors can provide a large range of doors including automatic bi-parting sliding doors, manual single and double powder coated aluminium entrance doors or specialist disabled access equipment. Hampshire Mezzanine Floors can provide a wide range of lifts including passenger lifts, goods lifts and DDA compliant platform lifts. Hampshire Mezzanine Floor will undertake all necessary building works to facilitate the introduction of the lift. 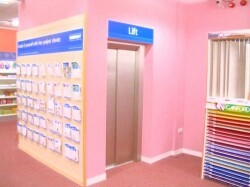 Hampshire Mezzanine Floors will also provide all necessary power and safety telephone for access alarm for lift usage. Hampshire Mezzanine Floors will design your complete electrical requirement to include power, lighting, emergency lighting and fire alarm system. Hampshire Mezzanine Floors will design your full mechanical installation to include heating, ventilation and air conditioning systems. 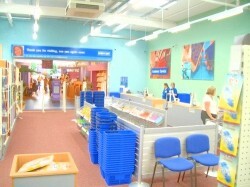 Hampshire Mezzanine Floors specialise in the design and installation of retail mezzanine floors. 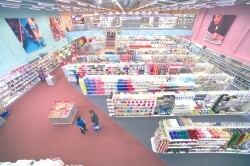 Click here to find out more information on a new retail mezzanine floor. 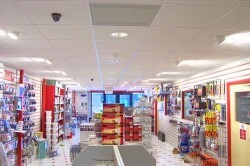 For more information on shopfitting, please contact us.